THE RIGHT CHOICE FOR A SOUND EDUCATION. 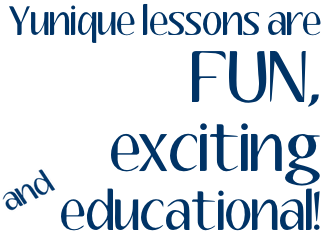 I have been teaching music lessons in my home for 14 years, and I have developed a Montessori-style of music education that is fun and really works! I use specialized learning materials that explain abstract concepts - such as reading rhythms, very concretely. The children play in groups but also receive individual lessons. This system enables me to teach even very young children to read and write music, which gives them the sense of accomplishment needed to stay with the program. 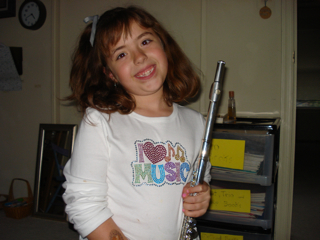 What is a "complete music education"? Discover Yunique music and you will find out! Music is a language; the physical instrument - the tool - matters not. We learn to play music by ear: listening and repeating, matching sounds following patterns. We play music by sight, concretely understanding how music is written, so they can read independently - with no prior knowledge of the song. We compose with stream-of-consciousness random creativity as well as utilizing structured musical patterns. Performance is another fun and important part of Yunique Music. The students are very involved in the planning and preparation of our concerts. They make the programs, help pick the venue, do a project related to their performance piece, and help promote the event. We talk a great deal about body language, stage presence and confidence. Is this because I think all my students will be pop stars or performing musicians? Of course not. However, I do know that all my students will someday need to know how to walk into a job interview with good body language and stand up at a meeting and look and feel confident. Playing an instrument in front of people takes nerve, and learning the skill of putting yourself out there in this way is vital to cultivating the skills necessary to believe in yourself and where your potential lies. I hear so many adults say, “Oh, I played when I was a kid.” I ask them, "Why don’t you still play?" The overwhelming responses are: “I hated to practice” ... “My teacher was mean...boring...too strict...[insert adjective here].” If it isn't any fun (or worse yet, painful! ), the student will quit at the first opportunity. If they're participating ➙ then they will excel. No matter what kind of kids you have - artsy and good at language, or scientific and mathematical - they will find their place in music!